We have been on the move to find affordable, stunning, beautiful, great antiques, and we think we have succeeded! Our latest addition to Mary Rose Collection is the Atelier, the chippy back room you’ll find downstairs. You may have peeked into that room in years past to see a jumble of unique finds, with the emphasis on jumble. We chipped just enough plaster off the brick walls and columns and scraped just enough peeling paint to provide a backdrop for some of our latest finds. If your favorite antique shops give you a chance to dig through the piles, this is your opportunity. The Atelier, French for workshop, is a work in progress with furniture being painted as we speak. All Polish pottery is beautiful, but the best is created by the artists and craftsmen at the Ceramika Artystyczna factory. The intricate designs and whiter more dense clay set Ceramika Artystyczna apart and allow it to combine function with beauty. Each piece is individually handcrafted in Boleslawiec Poland on the Bohr River, an area known for the highest quality stoneware for centuries. We carry both Traditional and Signature (Unikat) Series. 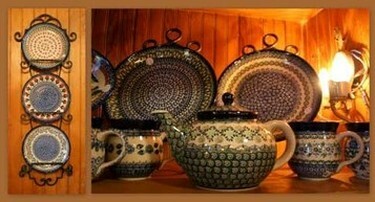 The traditional series depicts patterns that have been pleasing families and collectors for centuries. Using traditional techniques that are hundreds of years old, artists incorporate the spots of a peacock's feathers in classical arrangements. They use designs cut into sea sponges for hand stamping and brushes for more intricate patterns. Traditional pieces have a distinctive cream colored edge and are less expensive than the signature pieces, but still highly collectible. In the signature (Unikat) series each piece is hand painted and signed by one of Ceramika Artystyczna's experienced artists. Only twenty-three artists have demonstrated the skill to create these unique designs. These artists have developed numerous intricate patterns and styles. Each piece is of highest quality and is truly a piece of art. We think you will love incorporating these pieces into your home and dinner table. April Cornell specializes in hand silk-screened prints for housewares, including tablecloths and linen napkins. Mary Rose and her family have been incorporating April Cornell linens into their homes for years. These linens are a simple way to add rich color to a table setting and an entire room. Try setting April Cornell linen on your end table for a week and you'll be hooked! We think that you will love the harvest colors available for fall, cheerful spring florals, as well as April's holiday designs. Even if you don't have a Scandinavian background, as a Midwesterner you should be able to relate to the need for vibrant color during the long winters. 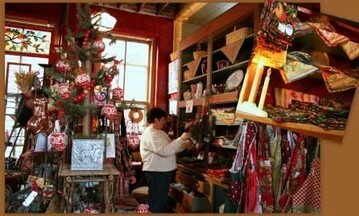 Scandinavian style is especially fun at Christmas, but many items can be displayed all year long. Daisy Mae is Mary Rose's daughter company (it's Kate's!). 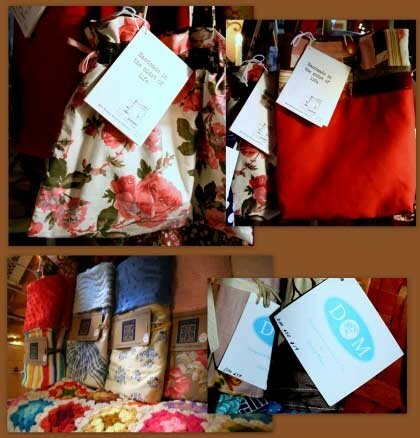 Daisy Mae makes one-of-a-kind bags and other special accessories for your everyday life. Each item is carefully handcrafted to be a unique representation of skill and love. In addition to her new items, the Clear the Trace line specializes in breathing new life into recycled clothes and textiles through screen-printing and reconstruction. Some things are just too beautiful to throw away, and even if they aren't, our forest, prairies, lakes, and hillsides are certainly too beautiful to clutter with abandoned items. That's why she started Daisy Mae's "Clear the Trace" collection. She is part of an exciting renewed "quilt mentality". Traditionally quilts have been pieced together out of scrap fabric or flour sacks. This quilt mentality can be used with countless resources. Like rearranging several broken strands of vintage beads into a one-of-a-kind necklace. Or screen printing tired shirts with fresh designs. Or saving high quality fabric samples from landfills to create bags of all shapes and sizes. Look for "Clear the Trace" tags for ecologically minded goods. Daisy Mae also makes accessories out of new materials. Each thing is a unique and individual creation. I rest my insecure perfectionist soul knowing that my customers realize that everything is handmade, and that there is not another one exactly like it. Look for "Daisy Mae" tags for these items. If you have forgotten how much brilliance stained glass adds to a home, visit Mary Rose Collection. Light pours through rich colors and dances through bevels. 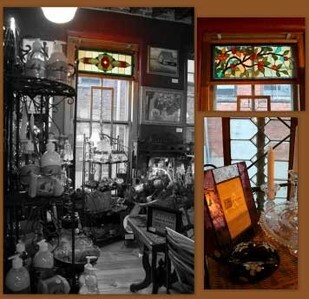 Mary Rose Nichols designs and creates these vibrant stained glass windows in the front studio of the shop. Windows of various sizes and picture frames are available for purchase. In addition, Mary Rose works with clients to design custom pieces. Kitchens have been updated with stained glass incorporated into cupboard doors and lights. Mary Rose also designs pieces to be built into doors and windows. Typically, clients begin by looking through Mary Rose’s numerous books. 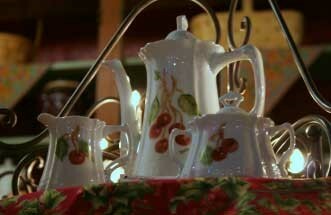 They find several designs they like, and Mary Rose develops a custom design that incorporates their wishes. Once the design and colors are agreed upon, a price is determined, and Mary Rose goes from there. Mary Rose also offers classes during the winter. As an avid berry lover, Mary Rose works hard to give her berries justice. She also paints other fruit and flowers. Her designs rarely include the background typical in traditional china painting. This allows her creations to complement modern and old-fashioned homes. Other Products at Mary Rose Collection . . .